At this point, you successfully coupled to the trailer, but it’s not quite time to head down the road. The electrical and air lines need to be connected and the landing gear needs to be raised all the way up. On the back of the truck, on the driver side, there are 3 lines: red, green, and blue. 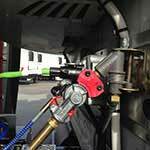 The red line is the air line for the trailer’s emergency brake. The green line is the electrical line. 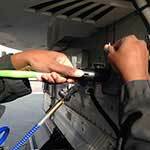 The blue line is the air line for the trailer’s service brake. 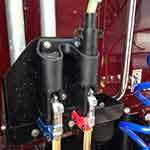 Connect these lines to the corresponding couplers and socket on the trailer before moving the trailer. We recommend starting with the blue line since it is the farthest away. 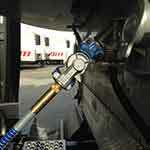 Grab the blue line by the glad hand and pull down to release it from the coupler on the truck. Place the blue line’s glad hand at a 90° angle with the trailer’s blue coupler. Slide the glad hand’s groove into the coupler to lock the line into place. The end result should make a straight line from the coupler to the line. Next, move on to the green line. 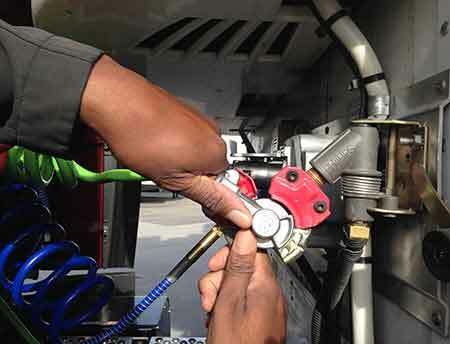 Grab the green line by the black plug and pull up to release it from the truck’s socket. Next to the blue coupler is a round, silver, flap-covered socket. Lift the flap and push the green line’s plug into the socket. Finish the connecting process with the red line. same steps as the blue line. When finished connecting the lines to the trailer, move to the passenger side of the truck to raise the landing gear. 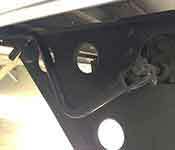 crank handle for the landing gear will be hanging underneath the trailer. Release the crank and swing it outward, toward you. Rotate the crank handle until the landing gear is all the way up. If the landing gear is hanging too low, you run the risk of snagging it on rough road or on a turn which could possibly damage the equipment. 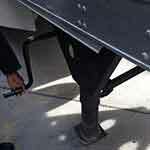 After raising the landing gear, place the crank handle back on its hook under the trailer. With the 5th wheel locked around the kingpin, the electrical and brake lines connected, and the landing gear raised all the way up, you are ready to hit the road. 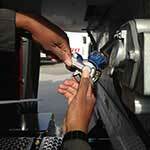 Make it a safe day!